For a long time with Canon, if you weren't dropping nearly three grand on a 5D, you were stuck with a vastly lesser DSLR. The $1700 7D is Canon's first semi-pro DSLR, and actually it's my favorite yet. What makes it my favorite Canon so far is actually everything that's completely new to Canon—DP Review has a nice summary here, in pictures. But in short, while this might sound weird, it shoots more like a Nikon than any Canon DSLR I've used. This is primarily because of the new 19-point autofocus system and the color metering system that goes with it. You're able to select AF zones—clusters of AF points—while in the past with Canon you've been limited to a full AF blast or picking out a single point. The system is also more customizable, so it can be locked with different default focus points depending on whether you're holding the camera horizontally and vertically orientations. Against Nikon's D300s, Canon's new AF system mostly kept up, and definitely performs better than autofocus on the 5D Mark II. The new viewfinder now provides 100 percent coverage, unlike previous Canons in this range, and it uses a new polymer LCD network for the graphical overlay to display AF points, grids and other displays, so it's more flexible and feels more fluid. (It also just looks swankier, and again, more Nikon-like.) Your other viewfinder (when you're shooting video, anyway), the LCD screen, is a 3-inch, 920k dot display like the 5D Mark II and it's still excellent, with a wide viewing angle, nice color and the right amount of crispness. Truthfully, I've been mildly surprised at the quality of photos that've come out of the 7D, which uses an absolutely stuffed 18-megapixel, APS-C sized sensor. (So, there is a 1.6x crop factor.) For comparison, the D300s has a 12MP sensor that's the same physical size (Update: For nitpickers, yes, Nikon's DX format is marginally larger than Canon's APS-C sensor, with the D300s's sensor coming in at 23.6 x 15.8 mm to the 7D's 22.3 x 14.9 mm.) The the D3 only goes for 12 megapixels on its bigger full-frame (35mm-equivalent) sensor. The 5D Mark II has a 21MP full-frame sensor. And typically, the more pixels you try to cram on a sensor of a given size, the more the image quality degrades, especially when it comes to low light, high ISO shots. I was expecting a noisefest, or at best, seriously noticeable noise reduction employed by the camera's software. It is clear that Canon's using incredibly sophisticated noise reduction algorithms with the dual Digic IV processors onboard, though the effects are less drastic than I expected. It's most apparent, actually, when you directly compare photos taken with the D300s. Looking at photos taken with the 7D and D300s at 100 percent crops, the D300s's images are noisier, but they also preserve more detail. 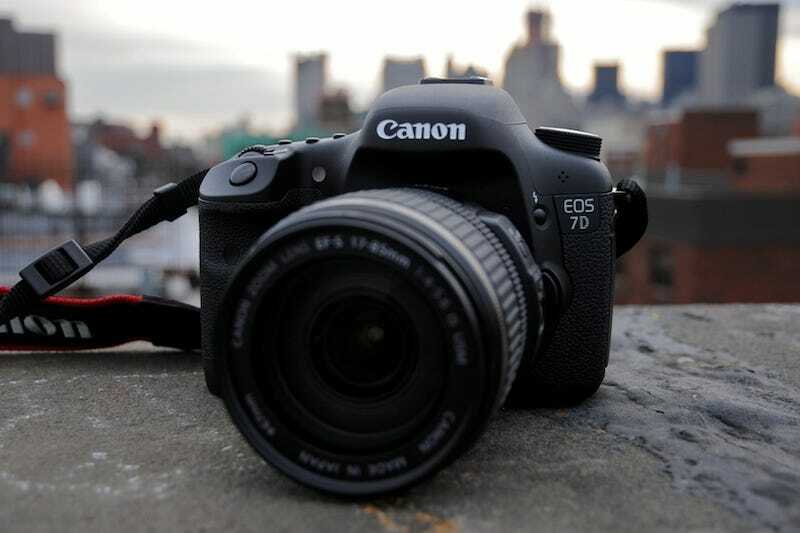 For web-sized images, the 7D's images look better, with less noise and more smoothness. I've got two sample galleries—an array of sample shots, and then another directly comparing the 7D with the D300s in low light situations, using identical settings for photos. 100 percent zooms follow photos in both galleries. Or you can download full size photos from Flickr here and here. You can get sense of Canon and Nikon's philosophical differences with the difference in their buttons for video: Canon makes a distinction between Live View and video mode, while Nikon is ready to start shooting video as soon you tap the live view button on the D300s. Creating video is a separate, dedicated event for Canon, in other words, and there is a semi-serious video camera that happens to be built into a DSLR. Nikon's D300s, on the other hand, is a DSLR that happens to shoot video. With video, the 7D simply has the upper hand—video is very much a legitimized use of this camera, not a secondary one like the D300s. (As expected from a company with an entire wing dedicated to camcorders for pros and consumers.) Not only does it have full manual controls, I find that it's slightly easier to use that the D300s while shooting video—not to mention the whole shooting in a real video codec at 1080p, yadda yadda. Three clips here: A melange of video above, and then by two videos, one from the 7D, one of the D300s, that mirror each other. Both were shot at ISO 6400, and you should be able to catch them at full res if you click over to Vimeo. The 7D is heavy, heavier than the 5D, but it's also slightly sturdier, with a build quality and weatherproofing that that's slightly in between the 5D and Canon's definitely pro 1D. It feels about the same in your hand, though. And it's roughly comparable to the D300s. Controls aren't radically different from other Canon DSLRs of this caliber—that is, it's what you'd mostly expect from a DSLR that sits in between the lower end 50D and the higher end 5DMkII, though it's a bit closer to the latter. While the menu system feels completely unchanged—leaving more advanced features, like the orientation autofocus a bit inscrutable—a few things are new on the outside: The power switch is up on the top left, under the mode dial; there's a dedicated button for switching to RAW/JPEG; a quick action button; and a new toggle switch for Live View and video, which you engage by pressing a start button in the center. The real question for Canon users who want something more than the lower end 50D is whether they go for the 7D, at $1700, or full bore to full-frame with the $2700 5D Mark II. The 7D has a 1.6x crop factor which is useful for sports, a better autofocusing system, shoots faster, is slightly more rugged, and is $1000 cheaper. The 5D is full frame—which I suspect is the real consideration for folks—and takes slightly better photos at higher resolutions. Obviously, if you're locked into Nikon, with thousands of dollars in lenses, you're not going to jump to Canon, or vice versa. But Canon's dedication to DSLR video is proving formidable in carving out a new kind of market that Nikon might have some trouble competing in, since they're a dedicated still camera company, not a video company, too, like Canon. Really, both the D300s and 7D deliver for the money, though I think the 7D delivers more, since it's packed full of newer technology and for the people who want it, the video component is truly killer. Either way, it's proof that competition is good—it clearly wouldn't exist without the D300, and the D400 will be that much better because of it.